azu/textlint-formatter-codecov: textlint formatter for codecov json. azu/codecov-json-to-lcov: Convert Codecov json format to lcov format. azu/lcov-summary: Cat lcov file and show summary of coverage to terminal. azu/textlint-rule-no-nfd: textlint rule that disallow to use NFD well-known as UTF8-MAC 濁点. azu/textlint-rule-no-hankaku-kana: textlint rule that disallow to use 半角カタカナ. azu/textlint-rule-no-exclamation-question-mark: textlint rule that disallow exclamation and question mark. azu/textlint-rule-eslint: textlint rule integrate with ESLint. azu/textlint-rule-date-weekday-mismatch: textlint rule that found mismatch between date and weekday. azu/babel-preset-jsdoc-to-assert: Babel preset for jsdoc-to-assert. 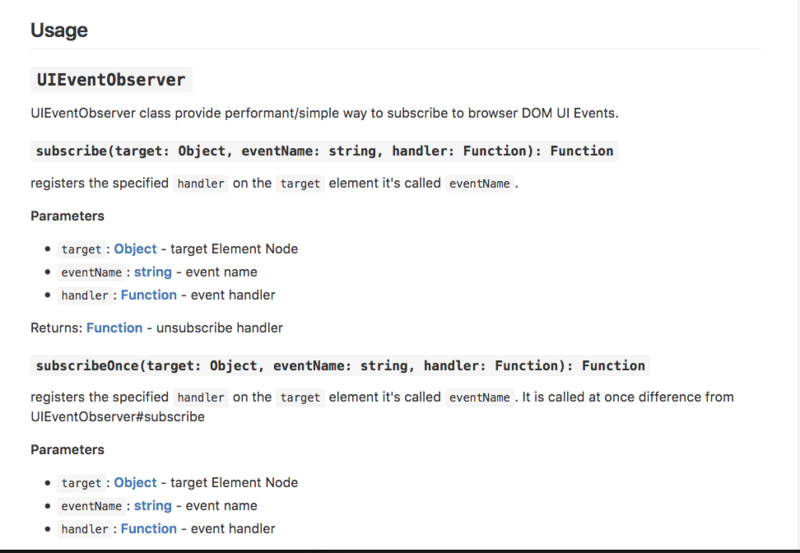 例) azu/ui-event-observer: Provide performant way to subscribe to browser UI Events. azu/add-text-to-markdown: Add stdin text to exist markdown file. azu/rewrite-npm-run-build-production-env: Add npm run build to NODE_ENV=production. azu/transfer-github-owner: Rewrite repository info on README/package.json for transferring GitHub repository. azu/strict-eval: eval code in vm module, but always strict mode. azu/github-to-twitter-lambda: Lambda bot that fetch own GitHub notifications/events and post to Twitter. azu/performance-logger: Simple Perf logger based on performance.mark API. azu/file-cache-cli: Command line tools that filter file paths by cached data. azu/add-deploy-key-to-github: Add deploy to GitHub from command line. azu/react-routing-resolver: Routing component, but It does't mount component. It's just resolver. azu/text-testing: Testing library for structured texts. azu/babel-plugin-strip-function-call: Babel plugin strip any function call. azu/lru-map-like: LRU cache top on Map-like. Support non-string key. azu/mu-pdf-viewer: PDF viewer on electron. azu/dayone-to-quiver: Convert DayOne's Journal.dayone to Quiver notebook file. azu/ui-event-observer: Provide performant way to subscribe to browser UI Events. azu/github-longest-streak: Online Viewer for GitHub Full Longest Streak. azu/eslint-plugin-no-allow-react-context: Not allow to use React context without specific directory. azu/git-log-to-errata: Git log to errata list. azu/textlint-plugin-asciidoc-loose: AsciiDoc/Asciidoctor loose support for textlint. azu/react-defer-render: ReactDeferRender defer first rendering of specific component.